Police in Howell, New Jersey are on the look out for a man who committed a lewd act in a movie theater while watching The Emoji Movie. A woman who was watching the movie with her children happened to see something worse than the animated movie playing on the screen and immediately reported it to the management of the Xscape movie theater last Friday. New York Post reports that management then confronted the man and asked him to leave and the woman called the authorities. Even though the theater is called Xscape, it's apparently "not that kind of theater," but it could be an honest mistake. New Jersey police are looking for a white heavy-set man in his 20s or 30s with some facial hair. He was last seen wearing a white button-up shirt, black pants, and a yarmulke on his head. When alerted to the situation, The Emoji Movie star T.J. Miller simply tweeted: "It's that good. It is." while retweeting the original story. T.J. Miller's social media response is perfect for the situation, especially since critics and moviegoers have been obliterating the animated movie. The Emoji Movie started Saturday morning with an unprecedented 0% on Rotten Tomatoes, but has since managed to go up to a whooping 6%. It is important to note that the audience score is at 44%, which is a higher approval rating than the current President of the United States, but that's definitely not anything worth celebrating. Impressively, The Emoji Movie was able to score the number 2 (or metaphorically) at the box office, just behind Christopher Nolan's epic Dunkirk. The Emoji Movie and Dunkirk were neck and neck for the early part of weekend, but Dunkirk pulled ahead to earn its number 1 spot for the second consecutive weekend. 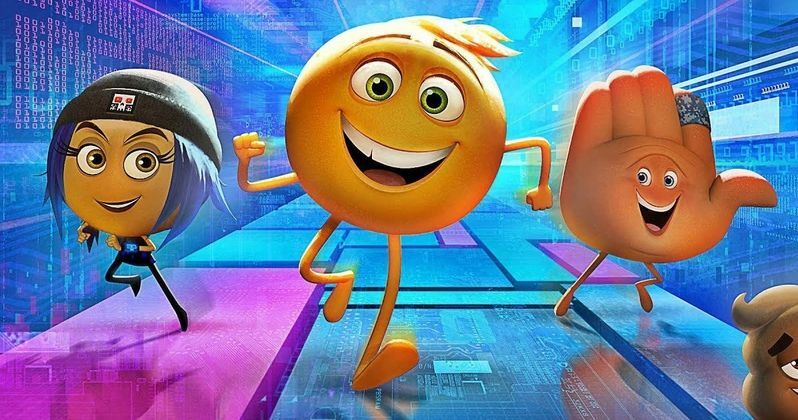 Critics have been wondering about how The Emoji Movie was able to pull off such an impressive opening and many are speculating that it's because reviewers were not allowed to run their reviews until Thursday. If true, Sony was very smart to do so since the entire world seems to run to Rotten Tomatoes to see the aggregated score for an upcoming movie. And why wouldn't they? Moviegoers are able to make an informed decision by balancing critic reviews with fellow moviegoer reviews and if there aren't any early reviews, the movie choice gamble may take place like the good ol' days before tomatoes and fresh ratings. Regardless of what the critics and majority of moviegoers are saying about The Emoji Movie, one man truly enjoyed the movie much more than probably anyone ever will in history. The animated movie may even get the rare distinction of receiving the very rare "three thumbs up," which is just begging to be thrown on future promotional material for the movie and on the cover of the Blu-ray release chalk full of bonus material. In all seriousness, if you or anyone has any information about the super fan of The Emoji Movie, please contact the New Jersey police department.